Macomb Western Academy H.S. "Cardinals"
Macomb (population 20,500) was named after Alexander Macomb, a War of 1812 hero, & one of the first graduates from West Point. Along with Thomas McDonough, Macomb led troops to victory on both land and water over the British at Plattsburg, NY and on Lake Champlain in 1814. The victories became a crucial point in the war as the United States turned back the British. McDonough is also known in Western Illinois because the county that Macomb sits in is named after McDonough. Macomb later served as commanding general of the U.S. Army from 1828 until his death in 1841. The city of Macomb sits right in the middle of an area in Western Illinois known as the Military Tract, which was given as a reward to those who fought in the War of 1812. It is positioned exactly in the middle of McDonough County, not far from where the first log cabin built in 1829 by Rev. John Baker. As a city, Macomb was officially founded in 1831. Major routes that serve Macomb include US 67 & US 136, and the LaMoine River runs thru the north end of town. The Burlington-Northern RR also has a line that goes thru Macomb, which is situated between Quincy (65 miles southwest), Monmouth (33 miles north), Galesburg (48 miles north), and Peoria (50 miles east), with all mile counts estimated as straight as the crow flies. The earliest known history of education in Macomb began in 1834 when a private, one-room log building was opened. A year later, McDonough College was established, but failed as did four subsequent others before Western State Normal College (now Western Illinois University) opened in 1899. 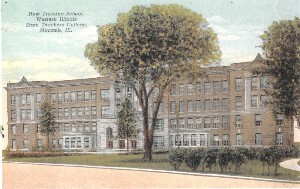 Western Academy and Western High School were a part of the campus, serving WIU from 1902 to 1973. Western State. 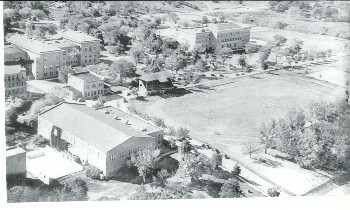 The school was known as "The Lab School," "The Academy", "Campus School," and later, "Western High," thus leading to an all-incompassing name, "The School of Many Names." School song: "We're Loyal to You, Western High"
We're loyal to you Western High. For we know you have sand, Western High! Victory from you Western High! Western Academy's "Million Dollar Gym"
Macomb Western offered football, basketball, baseball, track, tennis, and wrestling to its male athletes. The Girls' Athletic Association (GAA) was offered at the school beginning in 1919 in order to encourage female students to participate in sports. Other schools saw how Western ran its GAA program, and adopted it for their own use. Before you start reading, take a quick break because the football program was the primary story in the school's athletic history. There was limited success in 1920-40, as the program was 9-40-3 under Ralph Barclay, a Western grad himself. Barclay's Purple Preps recorded their first winning season ever in 1941, going 3-1-1 before he gave the reins to Jim Schultz, whose 1943 & 1944 teams were 4-1 and 4-2, respectively. 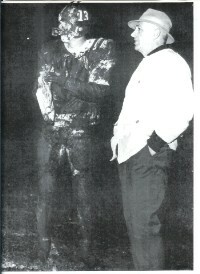 The school stepped its rise when Larry Kerker coached the first unbeaten teams in 1948 (6-0-1) and 1949 (7-0). Harry Sockler's Cardinals made their school proud with 10 undefeated seasons from 1952-67 as Western High went 114-12-2 in those 16 seasons for a winning percentage of .905. Included in those 10 undefeated seasons were winning streaks of 35 and 24 games, the latter being the last 24 games that Sockler would be on the sidelines at WHS. And to boot, the 1967 team went defeated and UNSCORED upon! Larry Hepinstall succeeded Sockler in 1968, leading the next four teams to a combined record of 27-8-1, including a 9-0 mark in 1971 Mark Peterson coached the final season in 1972 with a record of 6-2-1. All told, Western's football program was 199-86-9 (.698) and either won or shared the LaMoine Valley Conference title 15 times. 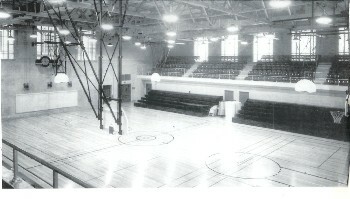 The Western boys began their hardwood program in 1916 under the eye of Erskine Jay, winning only one game that season. The program was competitive for many seasons, including several 20-win campaigns, and a trip to the Sweet Sixteen in Champaign during the 1950-51 season, despite having an enrollment that was around 200 students. Western's Bernie Justus hit a buzzer beater to win the game. Western's Doug Abel & Harry Fritz combined for 48 pts. in the championship game. Baseball was first offered at Western in 1932 as a spring sport, then played in the spring as well as the fall in several seasons when football was not offered in 1936-37. Despite not having its own field for practice and home games thru the late 1940's, the Purple Preps did win some hardware along with the Cardinals, taking five consecutive McDonough County tournament titles in the late 1950s. Baseball was discontinued after 1968, although one game was played in 1971. Hammond, Pogue, Warren Abbot (120 high hurdles), and Ted Pawlias (two-mile run) set LaMoine Valley Conference records for Western before the school closed in 1973. Brian L'Hommedieu, and set the 100-yard butterfly record. Huttiger also finished fifth in the state 200-yard individual medley finals. found to prove this, the Cardinals never had a losing season with several players going to the state meet (although none of them placed high enough to medal at the finals). 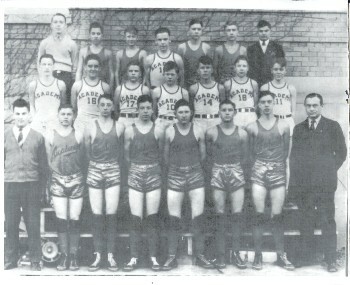 These two sports were held only for a short time in the school's history (tennis from 1956-59, wrestling from 1963 and 1966), but there were no qualifiers for the state meets. Larry Kerker (1947-51)--22-10-1 in football, 129-55 in basketball with three regional titles, one sectional, and an appearance at the state finals! Jim Hammond (1957-58) First-team little All-State in football, and second in state track meet in 440 Yard Dash. To Steve Monger and Marla Vizdal from Western Illinois University for the countless amount of information and pictures provided to us, along with Buck Knowles (class of 1940), Gary Sherer (class of 1959) and John Knowles (class of 1968) for their information and background needed to write this page. John's very informative document on the history of the school ( http://www.wiu.edu/users/whs/) was used to research the history of the school, along with a copy of "Reflections" found in the Western Illinois University archives, published prior to the closing of Western High.